If your read the earlier posting on this blog (see below) you know the reasons why I like the Tigers reportedly dealing Rick Porcello to the Red Sox for Yoenis Cespedes Thursday. They needed to balance out their club. Cespedes, even though he is older, has a higher ceiling as an every day player than Porcello as a starting pitcher, unless somehow Porcello can change his "pitch-to-contact" ways. As is, Porcello's ceiling is as a No.3 or No. 4 starter. Both are the same place in their contract (eligible for free agency after this season). The Tigers would have liked to re-sign Max Scherzer, and it still could happen if the market doesn't open up the way his agent Scott Boras might anticipate. But Boras waits to the very end with his clients. The Tigers had to move so they don't get left holding the bag come later in the winter. 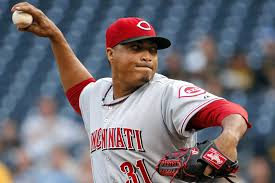 So you had the earlier deal with the Yankees for starting pitcher Shane Greene, and this one with Cincinnati for pitcher Alfredo Simon Thursday. The Tigers overpaid for Simon, who is eligible for free agency after this season. Eugenio Suarez was pushed to MLB sooner than ideal, and is still a mid-range prospect. Jonathan Crawford is a very solid prospect. He could come back to haunt the Tigers. Simon was brilliant the first half of last season, but very mediocre the second half. His value to the Tigers may come out of the bullpen. He was good there in 2012 and excellent there in 2013 before entering the rotation in 2014 and taking off, well, at least for a half a season. He has a power arm that actually plays out better as a reliever. So it's not as if the Tigers are blocked from re-signing Scherzer because they have Simon. He is insurance for the rotation, but he can also work from the bullpen, which might actually be preferred. Pat, Tigers are better today than they were yesterday. They also pick up a reliever, given the chance, should challenge for the 7 or even 8th inning role. The Greene trade was sharp. Porcello might have a better year than Simon but Simon should be able hold his own. All three pitchers do hit their spots more often than no, so they should be successful. I would bump Greene up to the #4 spot and let Simon pitch out of the pen until he is needed next April. The only thing I see fault is this winter is the bullpen could be trouble again.